A self catering rental with pretty cottage gardens,outside seating and barbecue. 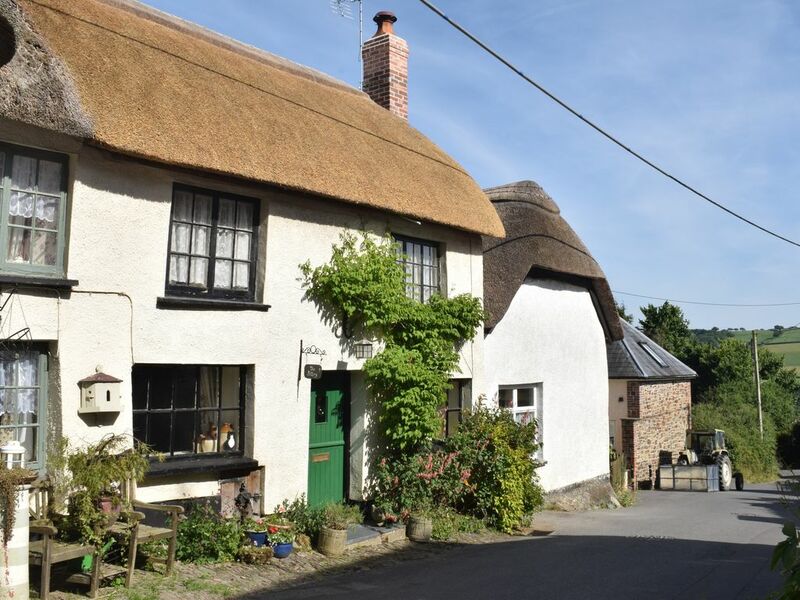 This Grade II listed thatched cottage is in the small working village of Bishops Nympton,home to wildlife photographer and presenter Johnny Kingdom. It featured briefly in the recent series 'Johnny's New Kingdom'. Available for holidays/ romantic weekend breaks . One small dog allowed. 3 miles from the market town of South Molton. We currently live in Bristol. We had often visited North Devon when our children were young. Eventually, we decided to buy a holiday home there. The Pottery was the first of many that we went to see - none of the others felt like a home from home. We bought it, then decided we would let others enjoy it too. We have been letting it for holidays since 2008. There being no gas supply to the village, we have electric storage heaters. Open plan downstairs room with distinct areas for kitchen, living, and dining. Four hotplates on a cooker. A single oven with grill. All you need, plus more. Separate TV in one bedroom. We have a nice little cottage garden. From the back door, there is a table and four chairs with umbrella. The barbecue is in halfway down the garden, and there is a decked area at the bottom,. Unfortunately, the cottage was not built with wheelchair access in mind. There is a step up to both front and rear doors, and the stairs are a little steeper than modern standards. Bed linen and towels are included in the price. Children are welcome but the stairs are quite steep and could prove a problem for the smallest. One small dog would be considered. In addition to the patio furniture, there is a picnic table at the end of the garden. The barbecue is built in. Heating is by night storage heater. There is also an open fireplace in the living room. Really lovely....we loved the wonky floors and ceilings though my husband's head did suffer a little! Had everything we needed and more... Cosy and comfortable... Slept really well... And lots of info from Tony and Viv... Wish we could have stayed longer! Thank you for your kind review, Elizabeth. We are glad that you enjoyed your stay at the Pottery, and look forward to welcoming you back another time! Summer is nice, as is autumn. Come to think of it, spring is pretty good too, and you enjoyed winter. We had a pleasant stay in this lovely old cottage. There were a couple of problems during the week which the owner was very helpful in sorting out. Loved our Christmas stay at The Pottery and it was so nice to arrive to a log fire all ready to be lit! Both cottage and village are full of character and perfectly located to 'get away from it all' without actually going too far. Wonderful walks from the door and many more within a short driving distance. Thank you for your kind review, Mike and Helen - we are pleased that you and your son enjoyed your stay at the pottery, and that you found the village a friendly place to stay. Come again any time! Located in the beautiful countryside of North Devon,Bishops Nympton is a working village near the market town of South Molton.The village has an excellent village shop and post office 400 yards away, by the new village hall . It has a church,St Marys which dates back to the12th century.You can often enjoy the peal of church bells.There are plenty of walks nearby and Johnny Kingdom runs his Exmoor Safaris from the village.A Devon Cream tea is a must during your stay and local ones are well advertised.Market days in South Molton are Thursdays and Saturdays where you can purchase vegetables,dairy produce,meat,fish and various country craft items.Barnstaple is only 10 miles away for more shopping.There are many houses and gardens to visit nearby including Arlington Court,Knighthayes Court,Rosemoor and even Dunster Castle.The nearest beach is Instow with Appledore across the water.Clovelly is quaint. Surf beaches are a little farther on at Saunton Sands,Croyde and Woolacombe.